Disclaimer: Please note, this post contains graphic discussions of slavery and lynching, including a graphic image of the latter. The patrol car moves on toward a modern-looking homeless shelter in the block behind the school. The same author retells a story of a woman who lives nearby the school. She lives in an apartment building with her small child and aging mother. The phrase “do not be afraid” or something similar appears in the Jewish and Christian scriptures a respectable amount. By a simple word search, “do not be afraid” gets me 55 hits, “fear not” = 44, “is/are not afraid” = 18, “do not fear” = another 45, etc. It’s a theme. Don’t worry, I’m sure its discussing metaphorical wealth, not actual money. Fear, some would argue, underlies our entire social system. Democracy offers a stable political enterprise because the leaders understand and fear the echoes of the bloody 18th century revolutions. Widespread popular movements–such as the one for Civil Rights in the 1950’s and 1960’s–spur change precisely because of this fear. The genius of Rev. King was that a revolution need not be bloody to be effective: in the age of capitalist hegemonic power, social and political disruption–however peaceful–threaten an economic and sociopolitical collapse of the ruling class. Police officers and others who responded with violence to sit-ins and marches personified this fear of revolution into a fear of a forced hierarchical shifting of society. 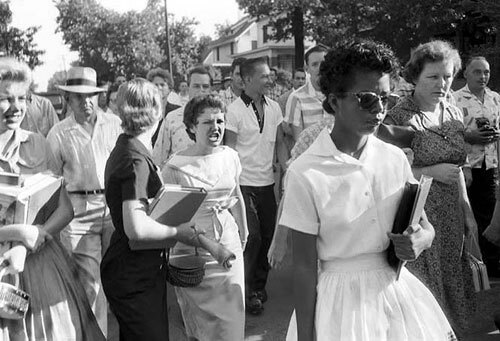 In other words, they feared that their own personal struggles–the day in and day out struggles of teenage life, the caring of small infants, difficult marriages, mortgages, jobs, and relatives–would minimized on account of some vague notion of “equality.” Especially when color was at stake. I have sung John Michael Talbot’s modern Catholic hymn “Be not Afraid” more times than I can count. But when have I ever been afraid? When have I feared, deeply? Existentially, spiritually, or emotionally perhaps, but these things fall well into the realm of #firstworldproblems. I never attended a school where police officers drove by, announcing their search for a missing infant from a nearby home. My schools were nestled in the suburbs of New Orleans: predominantly white, middle-class, and Catholic. As I understood it, the public schools (and a few different Catholic ones) accepted all the black students. In the late 1930’s, the Federal Writer’s Project was created in a post-depression political atmosphere “to provide employment for historians, teachers, writers, librarians, and other white-collar workers.” Thousands were employed from all over the country to interview the elders of society and remember the past for future generations. One of the most remarkable federal programs in the 20th century, this project recorded more than 2,300 first-person accounts of, among other things, slavery, including hundreds of photographs of former slaves. I seen old Master git mad at Truman and he buckled him down across a barrel and whupped him till he cut the blood out of him and then he rubbed salt and pepper in the raw places. It looked like Truman would die it hurt so bad. I know that don’t sound reasonable that a white man in a Christian community would do such a thing but you can’t realize how heartless he was. People didn’t know about it and we dassent [didn’t] tell for we knowed he’d kill us if we did. You must remember he owned us body and soul and they wasn’t anything we could do about it. While slavery had ended by the time of Hawkins interview, the oppression of black persons had not. 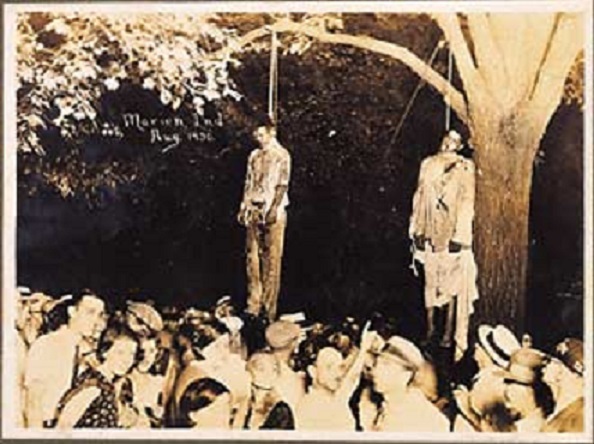 James Allen, procurator of a photographic collection entitled “Without Sanctuary,” has collected dozens of harrowing postcards and stories of the era of lynching in U.S. history. “Without Sanctuary” is a photo document of proof, an unearthing of crimes, of collective mass murder, of mass memory graves excavated from the American conscience. Part postal cards, common as dirt, souvenirs skin-thin and fresh-tatooed proud, the trade cards of those assisting at ritual racial killings…the communities’ best citizens lurking just outside the frame. In his collection, Allen presents the adjacent image, taken in August, 1930, noting the following: Under magnification, one can see the girls in this photo clutching ragged swatches of dark cloth. After souvenir hunters divvied up the bloodied pants of Abram Smith (R), his naked lower body was clothed in a Klansman’s robe-not unlike the loincloth in traditional depictions of Christ on the cross. Lawrence Beitler, a studio photographer, took this photo. For ten days and nights he printed thousands of copies, which sold for fifty cents apiece. Why show you this? On a week where scary costumes and horror films attempt to frighten a relatively safe, complacent consumer class of wealthy citizens, I have recalled the violent past in images and words not to terrify us in the present but to honor the true suffering of the victims by bringing them to the altar, and by bringing my sins along with them. For us–us fortunate view for whom fear is limited to nightmares and daydreams and the terrible but extremely unlikely middle-class school shooting–our fear more closely resembles that of the young couple in the photograph. Yes, that couple, in the bottom left-hand corner, smiling to the camera on an evening of romance, racism, and murder. But racism alone fails to explain the actions in that photograph. Clearly the white people in the picture are racists, but what does this mean? There are many answers, but I find a conception of fear particularly helpful here, for it removes the young couple from the photograph and places them directly in our living room. Their pleasure at the death of those two boys, a similar pleasure to one they might get at Sunday Church service, is drawn from a fear of those who would disrupt the common order of life. Their Christ, their romance, their fantasy of a small house with lovely Christian children is bombarded by a fear of this difference, this blackness, whose very existence screams SLAVERY and GENOCIDE in the face of their American Dream. But we cultured people in the 21st century do not lynch. We are far more sophisticated. Jonathan Kozol, the author from the beginning of my tale, also writes of Ana Oliveira, who directed an agency serving ex-prison inmates with AIDS, who notes a contemporary form of the lynching tree. We don’t have ‘pass cards’ in New York. Black women who have AIDS don’t have to clip a photo ID to their dress. You don’t need a permit to cross over at the magic line of 96th street. We just tell you the apartment that’s available is in Mott Haven, or East Tremont, or Hunts Point. “that’s where we can serve you best. Here’s a referral number. Call this agency. They’ll help you to get settled…’ For those who work within these agencies, as I do, it appears benevolent. And, of course, once you accept the preconditions, all these things are absolutely critical. A wider portrayal of fear paints a dark picture of our country. We rightly mourn the pure white victims of Sandy Hook, yet parts of Chicago (not to mention New Orleans) have become a bloody mess of poverty-stricken gun violence over the last several years, including a remarkably large number of children. Recently, even Stephen Colbert zinged a one-liner to his hip, young audience, riffing on the Obama administration’s attempt to rid Syria of chemical weapons but not regular weapons: “If America cared about shooting people, we’d be invading Chicago.” The audience cheered. I believe that the repeated Biblical provocations against fear apply more deeply to those of us who live in a society where we so easily dispose of our waste in government-subsidized ghettos, sending their children to terrible schools, and hoping that they remain complacent under some image of right society and the American dream. For the fears of us fortunate few have directed the entirety of culture. Today, somewhere in Chicago, New Orleans, or Detroit, some poor black children will pay the price for the centuries of genocide, enslavement, and torture. Christ, on the cross, will suffer with them. On the cross, he will turn to me and ask me to stop being afraid. He will force me into the place of the young couple at the lynching in 1930’s Indiana, and he will ask me: who have you lynched today?